This meeting is designed to bring together the disparate communities of researchers working on fish myogenesis, from basic developmental mechanisms, through disease models to muscle growth in aquaculture species. Aquaculture has the possibility to replace wild fisheries and limit the damage of global over-fishing that is catastrophically depleting wild fish stocks. Research on growth, in particular muscle formation, in commercial fish species is therefore urgently needed to enhance the efficiency of aquaculture production. Despite increasing understanding of fish muscle growth, and the effects of environment, insufficient insight into molecular and cellular mechanisms has been achieved, perhaps because aquaculture research has lacked convenient model organisms. 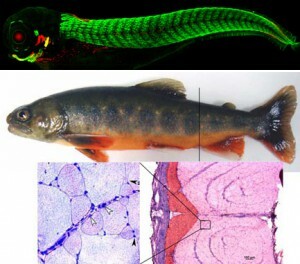 The rise of fish models in the basic biomedical sciences has created an opportunity for rapid progress in the understanding of fish muscle growth. The time is ripe to build networks to translate our deepening knowledge of fish myogenesis into commercial aquaculture. A news article was written by Kathryn Knight, Jonathan Leslie, Daniel Garcia de la Serrana and Jonas von Hofsten and was published in The Journal of Experimental Biology in August 2011.